The gastronomic and cultural programme also acts as a form of promotion for the host country. When the competition is based in a wine producing area, this involves visits to vineyards. As Christine Collins, organiser of five varietal competitions in Alsace, said, her competitions are structured to encourage judges to stay in the region either before or after the competition, with the aim of promoting local tourism. 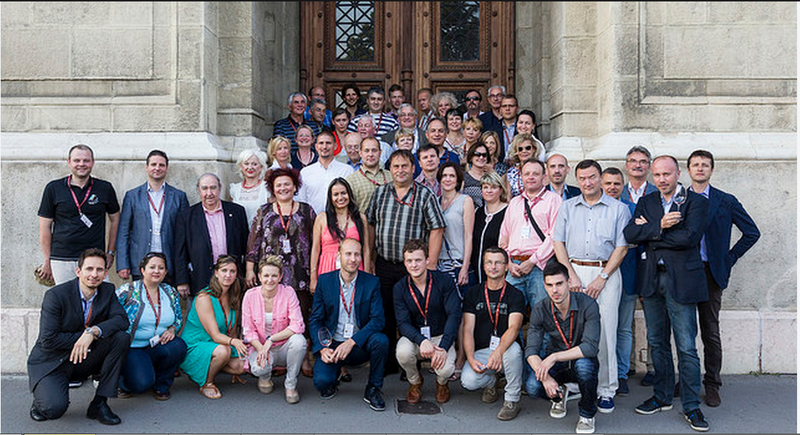 This year VinAgora was in Budapest and as such had no vineyard visits. Instead an interesting and varied programme was set up for us to enjoy very different facets of local food and drink. This had the added bonus for both the international and local judges to see where and how Hungarian wines are served in Budapest. 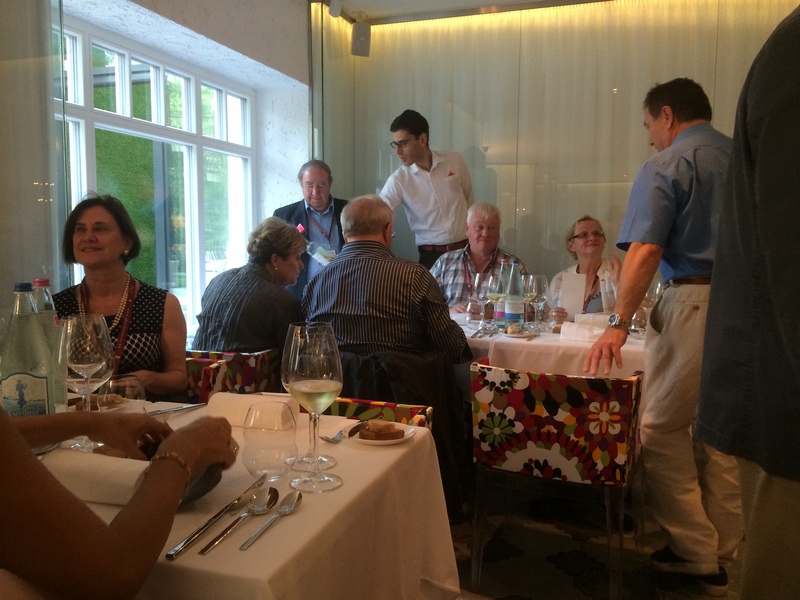 The judges first evening out was a very relaxed wine bar crawl – after a morning tasting 40 wines, in temperatures of 37C. We were given a booklet with a map and a list of different wine bars with a starting point at Anker’t and finishng at 360° Bar. We gathered together at Anker’t Bár, (Paulay Ede u. 33) a vast semi-open-air ruined factory in the former Jewish district. In 2002 the first ruin pubs opened up in Budapest, starting a trend of bars located in ruined buildings in the city, furnished with whatever could be found, from cinema seats, car seats, packing boxes. Every ruin pub is different. 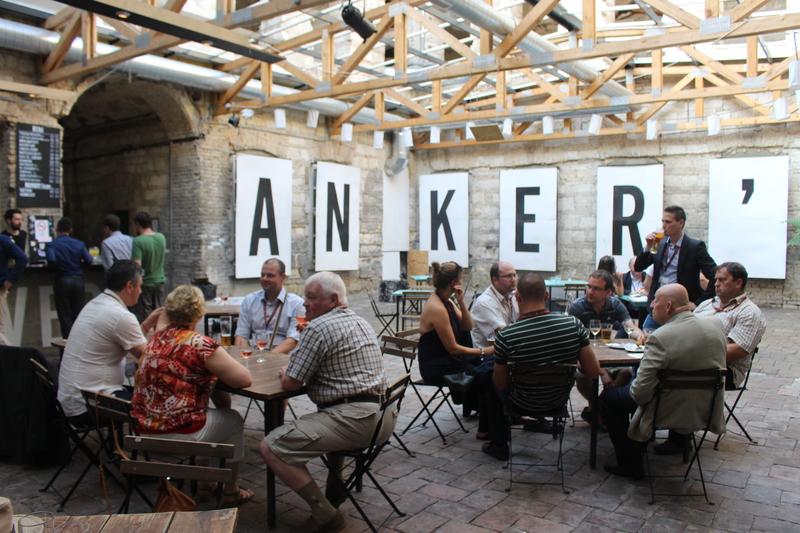 Anker’t, with furniture largely made from old pallets, opened in 2012. This ruin was basically a brick shell, apparently waiting for a sympathetic restoration project, and in the meantime is a lively wine bar spot. We had the back room which was slightly more enclosed. The warehouse-sized room to the front really felt like a ruin, temporarily decorated with lanterns, and was full of groups of early-evening drinkers. 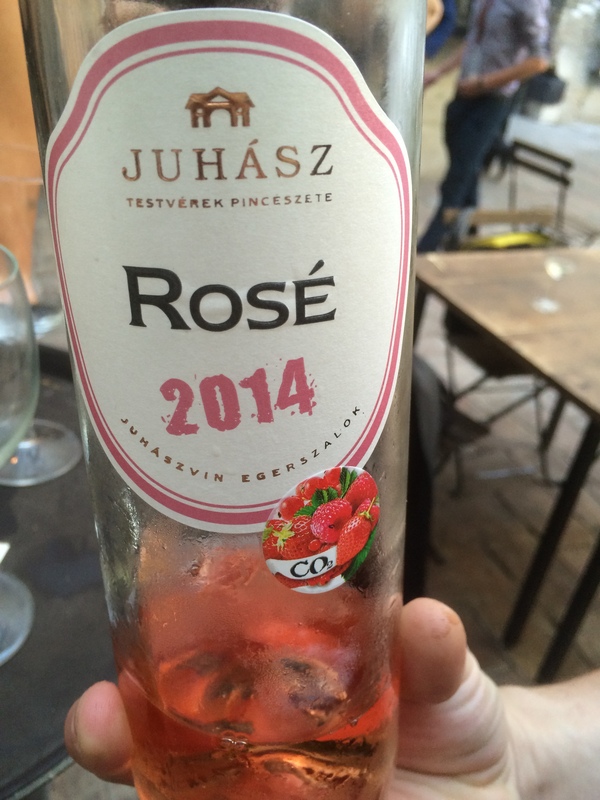 After our first drink, a cold, fruity, spritzy rosé by Juhász, lemonade or beer, with a range of nibbles, we started to dispeerse. My group made our way to our next wine bar, Etap Borbár (1077, Király u. 43). This was a much more traditional wine bar with a very stylish interior in natural woods, which opened in the summer of 2014. In the hot summer weather, its tables were spilling out on to the pavement. and by the time we arrived the bar was already busy. Etap Borbár works with twenty-six small family wineries, enabling the friendly servers to know the wine list well and to talk about each wine chosen. Here we had the new, and excellent, sparkling wine, the Kreinbacher brut prestige (a gold medal winner at Vinagora) from Somló, with platters of cheese and meats. We also had the chance to try some interesting pálinkas – traditional Eastern European fruit brandy – used for making cocktails. The beetroot pálinka and celeriac pálinka by Brill, were in particular very distinctive. 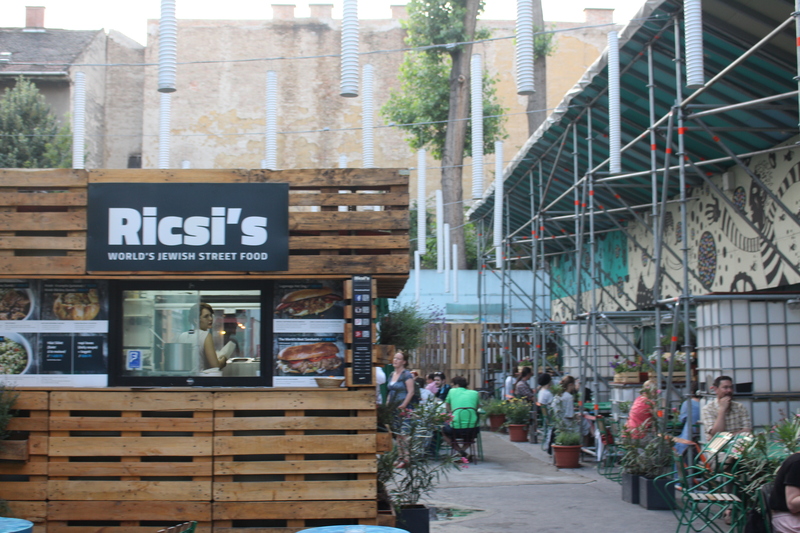 We then walked on to another ruin bar, Ricsi’s World Jewish Street Food, (1072 Budapest, Dob u. 40.). This new bar, in keeping with the theme of the Jewish quarter, serves a range of hearty ‘Jewish’ food, which has received enthusiastic reviews. A large group had just arrived and the place was packed, so, without stopping to try any of its delicacies (a shame! 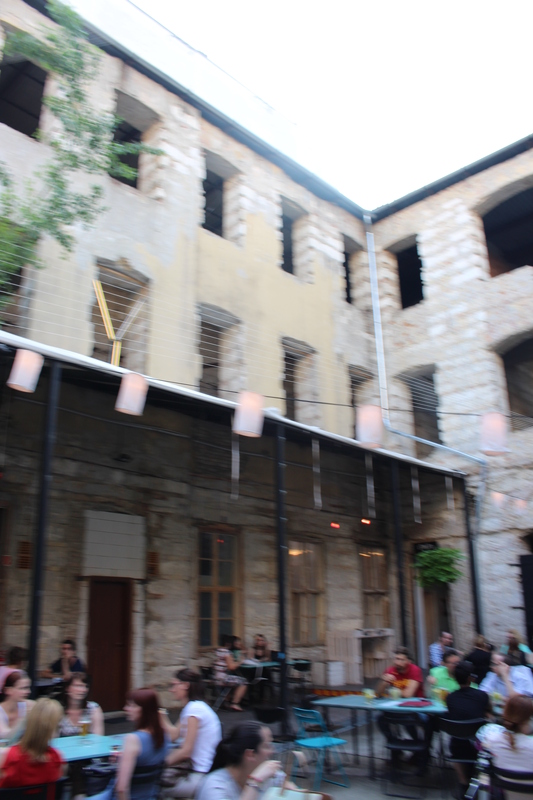 ), we walked on to the Kadarka wine bar (Király u. 42, 1061). By 7pm their pavement tables were full, so we opted to sit inside. Our Hungarian guide, Gábor, said this was his favourite wine bar. Less dramatic, not in a ruin, nor with ultra-stylish interior, Kadarka had an excellent selection of wine, delicious bar food and a very welcoming owner, Árpád Laurenczy. 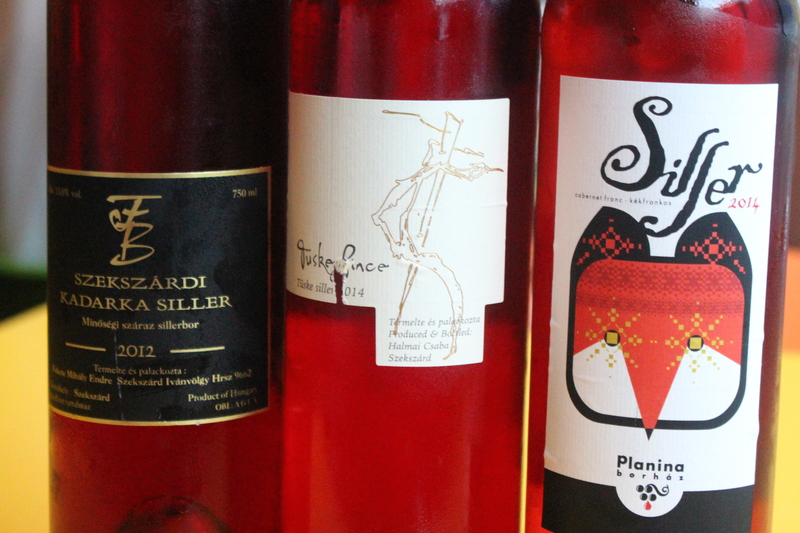 When I asked Árpád if he had any rosé wines, he served three different sillers. I have to admit that by this stage of the evening, I was not writing wine tasting notes – so these three did not make my review of Rosé Wines of Central Europe. Their styles ranged from sweet and fruity to dry, with berry fruit and a hint of tannin. 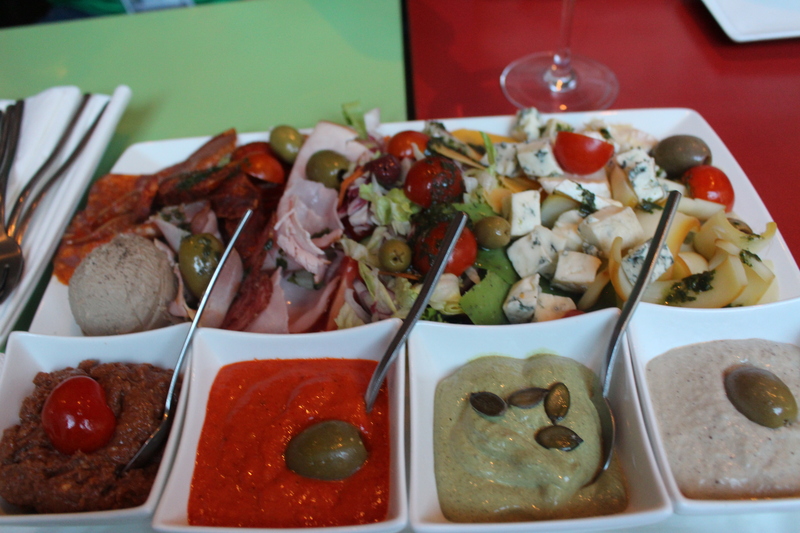 The food platter was excellent with meat, cheese, libamáj (goose liver paté), körözött (cream cheese and paprika dip), aubergine dip, and all sorts of interesting flavours. We then moved on to the final bar of the evening, the 360° Bar (Andrássy út 39, 1061), which opened in the summer of 2013 and added a rooftop kitchen in 2014. This bar was completely different to the other wine bars, with its roof top location on the 7th floor. When we arrived to see a queue of people waiting to be admitted, our hearts dropped, but luckily VinAgora had reserved space for us judges and we were whisked inside! 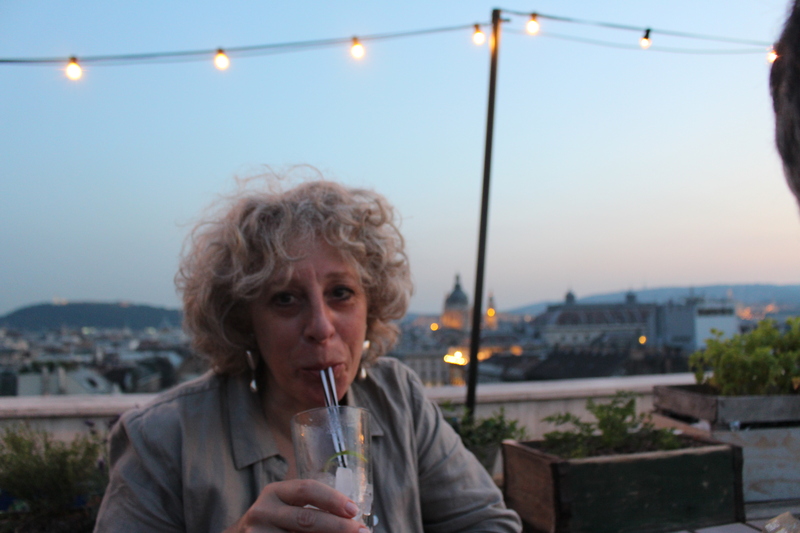 The 360 degree view from the top of the 360° Bar was certainly dramatic, and there is a lot to be said for an ice cold mojito on a balmy sunny night watching the sun set over Budapest. The evening ended with a spectacular firework display, for which the location gave us a grandstand view. 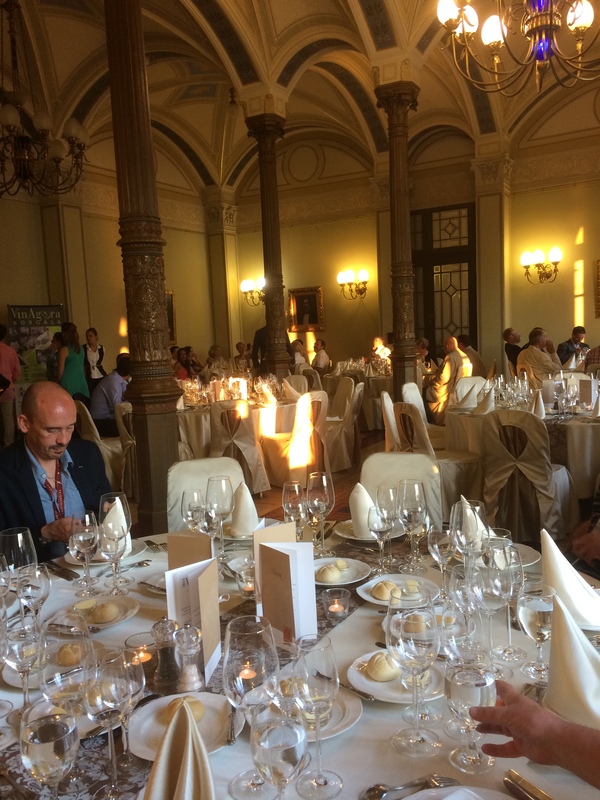 Our second evening took place in the Hungarian Academy of Sciences, located on the Pest side of town near the Danube, and started with a tasting of wine by young Hungarian winemakers – more on this tasting to follow in another post. After the tasting we made our way upstairs to one the Academy restaurants. The beautifully ornate 19th century dining room had views over the Danube had an old world elegance about it, the waiters had gorgeous jackets – Austro-Hungarian with braid (I want one!) and the perfectly synchronised serving was very theatrical. Different salamis with cucumber tartar and dill flavoured cheese served with ‘Tere Fere’ Balatonboglári Rajnai Rizling 2013, Podmaniczky Winery. Grilled duck with asparagus, carrots and potato cream served with Szeksárdi Bikavér Reserve 2012, Mészáros Winery. Cream cake with fruit tea flavoured honey gel, pineapple and melon served with Zéta 2011, Balassa Winery. The third evening for judges started with a walking tour of Buda’s palace, castle and old town, finishing with dinner at the Halászbástya (Fisherman’s Bastion) Restaurant, in a marvellous location at a major tourist site, overlooking the Danube and Pest. 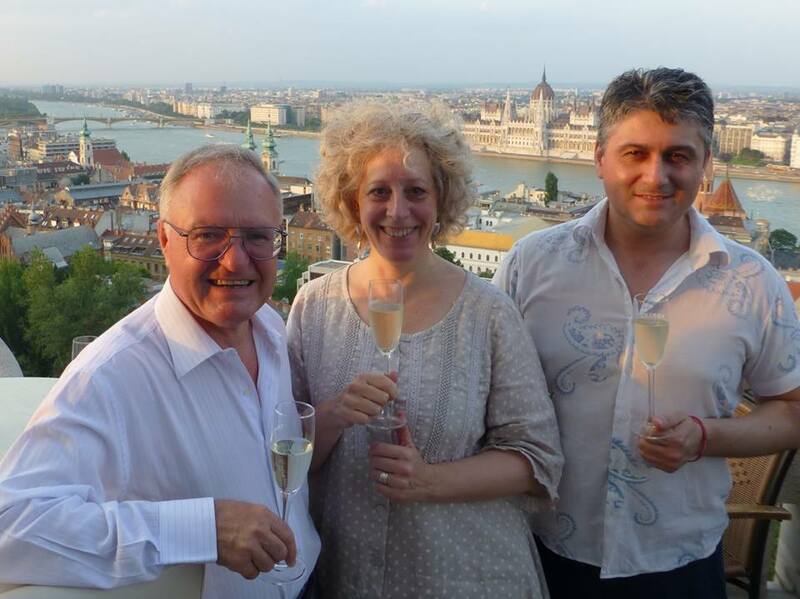 First aperitifs with a glass of perfectly chilled Törley brut and little canapés on the terrace overlooking the Danube. We then went down to the charmingly romantic neo-gothic restaurant. My table was in a rounded alcove with windows on three sides overlooking the Danube. Pear Strudel with Marzipan mousse, with Tokaji Hárslevelű Aszú 6 puttonyos 2007, Fitomarkt. The final evening, after the end of the Vinagora competition, was completely different. This was at Émile restaurant (1026 Budapest, Orló u. 1), opened a few months ago. It is the third in a group of Budapest restaurants, the others being the Michelin-starred Onyx and neighbouring Gerbeaud. Émile is in a large, converted villa in the leafy suburbs of north Buda. It is open for breakfast, lunch, tea and dinner; when we arrived in the early evening, families were still enjoying the last of their late tea, early aperitifs in the large front garden, full of large reclining chairs. Curried pea soup cappuccino with yoghurt froth, chickpea doughnut and paprika jam, served with Kunsági Cserszegi Fűszeres 2014, Frittmann. Rhubarb and raspberries with mango sorbet, with Badacsonyi Olászrizling late harvest 2011, Borbély Családi Winery. And so ended the 16th edition of the VinAgora Competition. 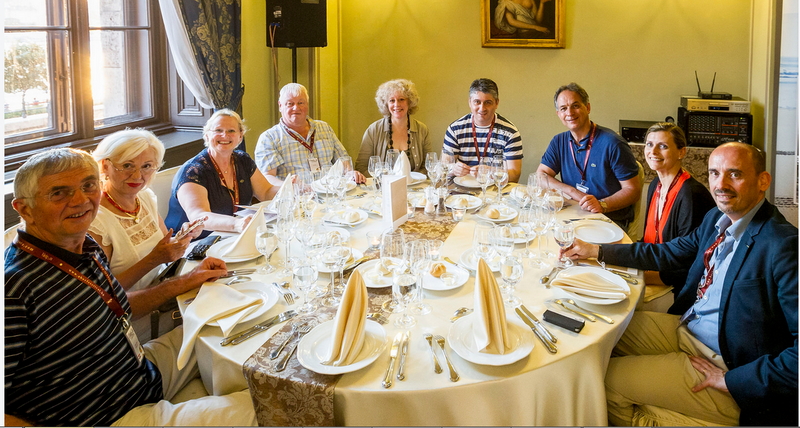 After four days of competition, outings and dinners, I had met old friends, made new friends and seen Hungarian wine away from the competition table and as part of the modern Hungarian gastronomic scene. 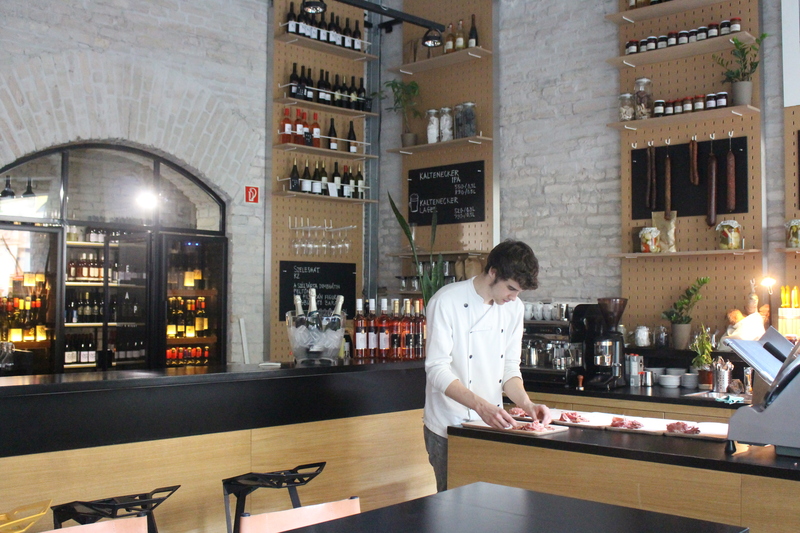 Every restaurant had presented traditional Hungarian food with a modern twist, smaller and lighter. Some of the Hungarians were disappointed that the food was not more gutsy and traditional, but on the whole, to the international judges, it was still distinctly Hungarian. More importantly, for events around a wine competition, was how well these dishes accompanied the wines with which they were matched. For me two starring matches stood out. 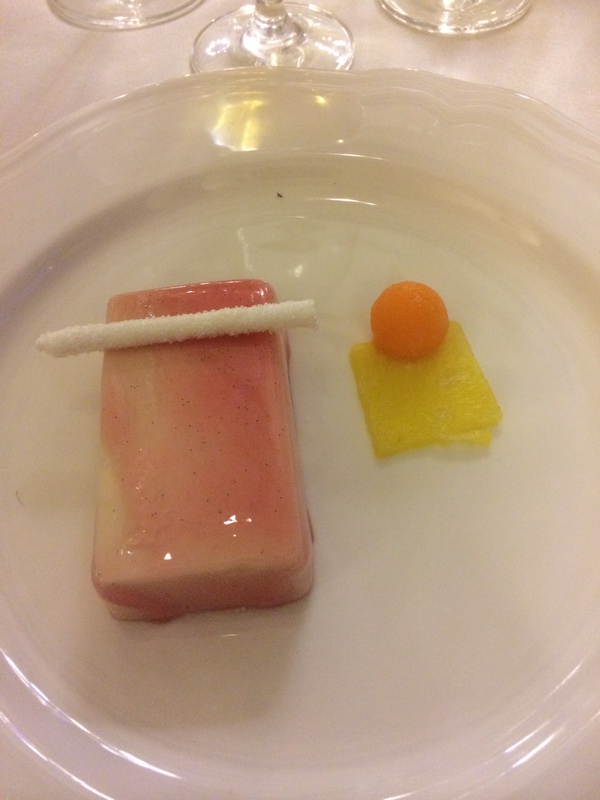 Firstly the cream cake with fruit tea flavoured honey gel, pineapple and melon served with Zéta 2011, Balassa Winery at the Hungarian Academy of Sciences. By no means an easy match, but the dessert had the ideal sweetness, fruit and acidity to complement the wine. 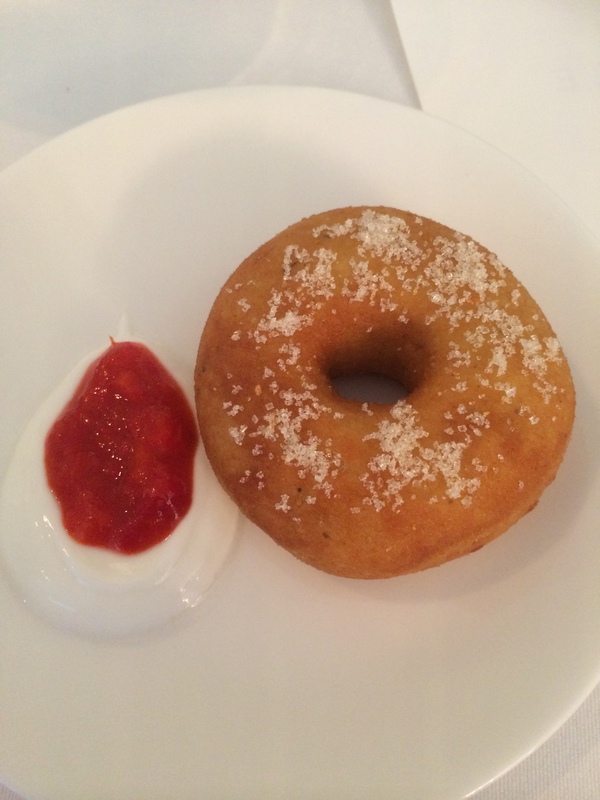 The second top match for me was the curried pea soup cappuccino with yoghurt froth, chickpea doughnut and paprika jam served with Kunsági Cserszegi Fűszeres 2014, Frittmann at Émile. The delicate spices of cumin,coriander and ras el hanout in the cappuccino matched perfectly the spiciness of the variety with neither overwhelming the other. Ohhhh it all sounds amazing! Budapest is definitely on my to visit list, and when I get there I will be consulting this post Liz. Thanks!